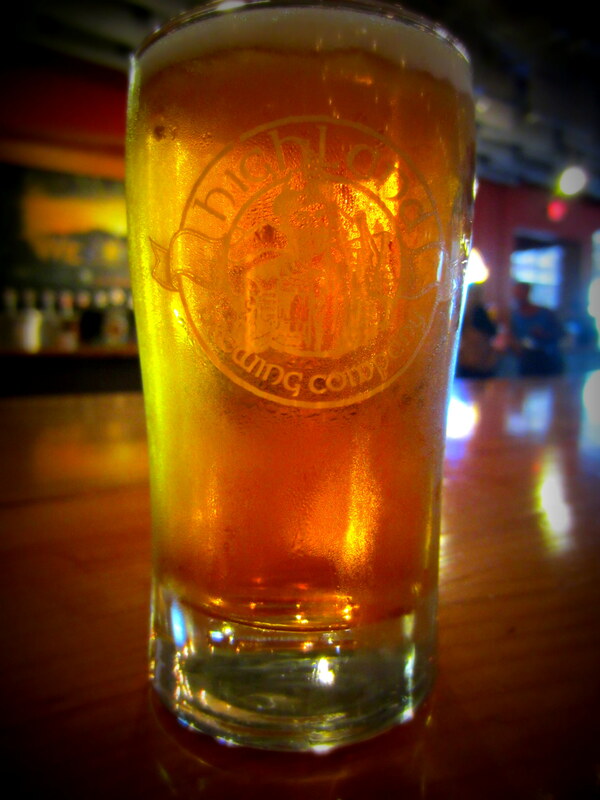 Founded in 1994 Highland is the oldest and biggest brewery in Asheville, possibly the largest in all of North Carolina. So it seemed obligatory to pay them a visit. 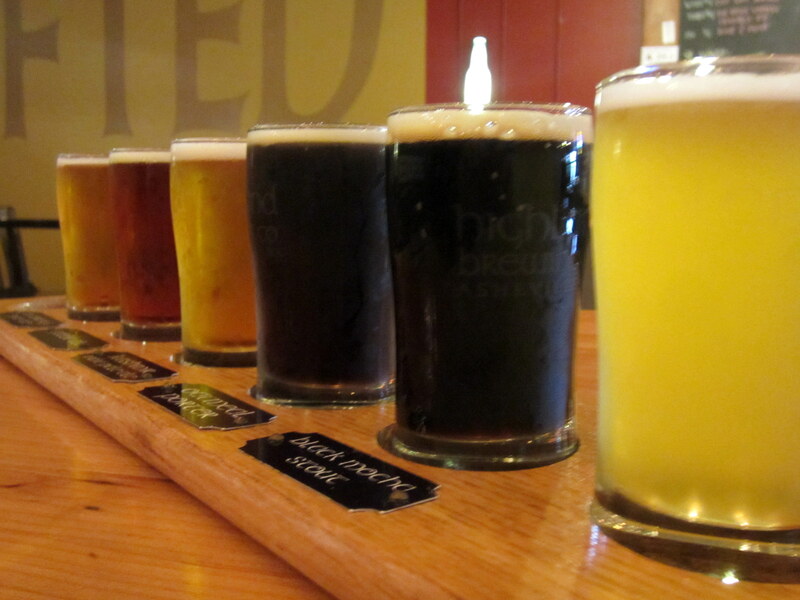 Highland Brewing was initially located in downtown Asheville in the basement of Barleys Taproom and Pizzeria. In 2006 they moved out to their new, much larger home on the east side of the city. They are definitely not within walking distance of downtown, so to start the Friday leg of my visit (now solo) I drove out to Highland, arriving 15 minutes or so after their 4 pm opening time. 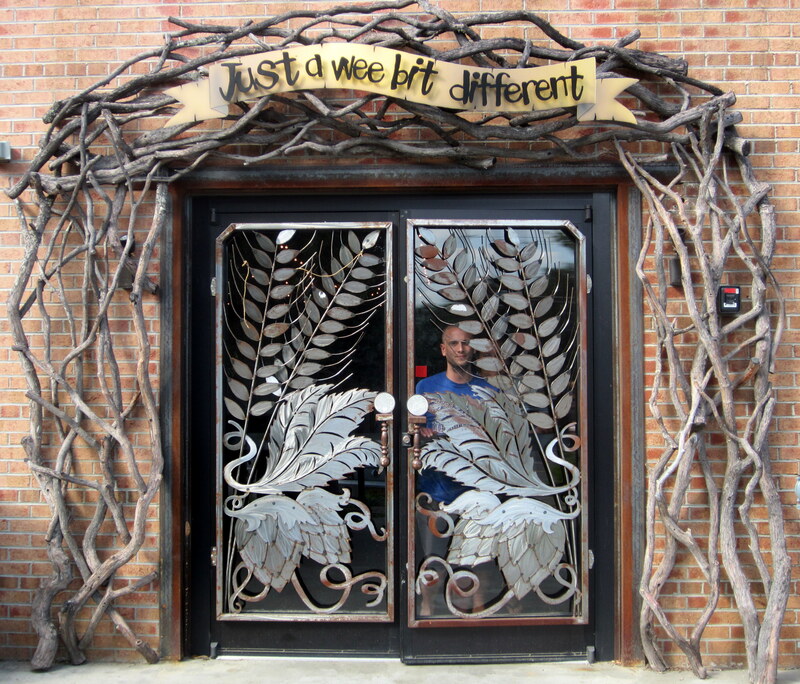 The entrance to the Highland Brewing tasting room. The tasting room is in a cavernous warehouse space with a stage at one end, flanked on either side by shipping containers that have been converted to offices, with a sound mixing board in the middle of the room. It’s obviously set up for reasonably large concerts, and from what I could glean these are pretty regular occurrences on the weekends (a schedule of live music acts can be found on the Highlands website). A large bar sits against the wall that separates the tasting room from the brewing facilities. There were three bartenders on duty so they clearly draw in a pretty good crowd. In the corner near the entrance various merchandise and bottled beer were available for purchase. The bar in the Highland Brewing tasting room. There were a couple dozen people in the tasting room when I arrived. More than half of them went on the 4:30 pm tour, which I skipped because I had just ordered a flight of beer. In retrospect maybe I should have gone on the tour. They give multiple tours each day at times listed on their website. They last about 30 minutes and you are required to wear safety glasses, which are provided, and have closed toed shoes. There is also a grassy field surrounded by trees adjacent to the brewery where they have installed a stage and a bar (in a converted shipping container). When I arrived a couple of food trucks were already parked next to the field (its called the meadow on the Highland website). It looked like there was going to be a concert that evening, but I had breweries to check out so I couldn’t stay. Note that they don’t serve flights at the outdoor bar. My flight consisted of six beers, five year round beers and one seasonal, for $8. The first three beers I tried (Razor’s Wit, St. Therese Pale Ale, and Kashmir IPA) were pretty uninspiring, easily my least favorite beers of the entire trip. Things improved when I moved to the Gaelic Ale, a British-style ale that featured nice toffee flavors balanced by northwest hops. I thought the last beer of the flight, Black Mocha Stout, was probably the best. It was black and opaque, full bodied with a big coffee nose, and the taste was a nice mix of coffee and chocolate from the roasted malts. I finished my visit with a 10 oz glass of their 20th Anniversary Scotch Ale that I quite enjoyed. Still I have to say that I had a glass of that same beer two nights earlier in Knoxville and I thought it was better in Knoxville. Maybe it was just my imagination but all of the beers at the taproom seemed to be too highly carbonated, something that was particularly apparent on the stout and the scotch ale. The tasting flight at Highland Brewing. Highland was the only place I visited that has live music on a regular basis, or gives tours of the brewery. 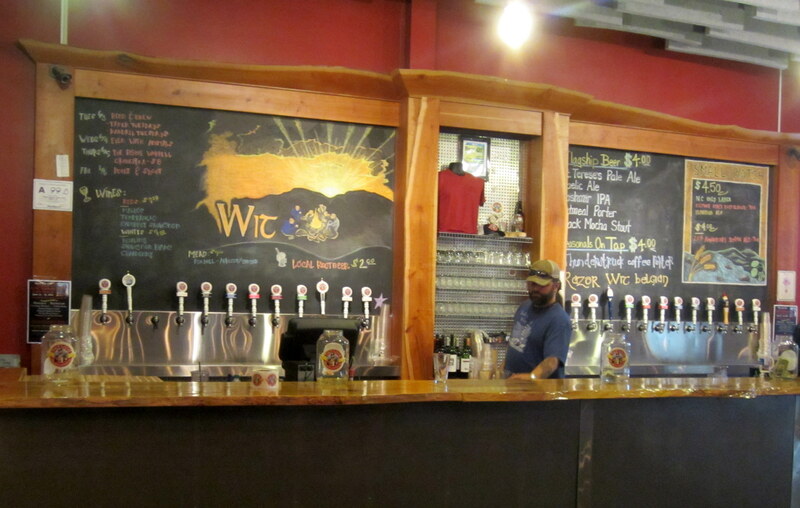 Either of those could be valid reasons for visiting the brewery, but in my opinion it is not worth the trip out to east Asheville for the beer itself. The pale ales were mediocre at best and while the darker ales were decent, I’m pretty sure you could get those same selections at many bars in Asheville or for that matter in bars across much of the Southeast. Hitting the Asheville Ale Trail Part 3 – Burial Beer Co.